During last night’s book tour event, Van recounted the story of his year-long struggle with severe depression, when he felt like an Easter egg that was beautiful on the outside and empty on the inside. But eventually after much inner work he concluded “I’m a good guy” and moved on. 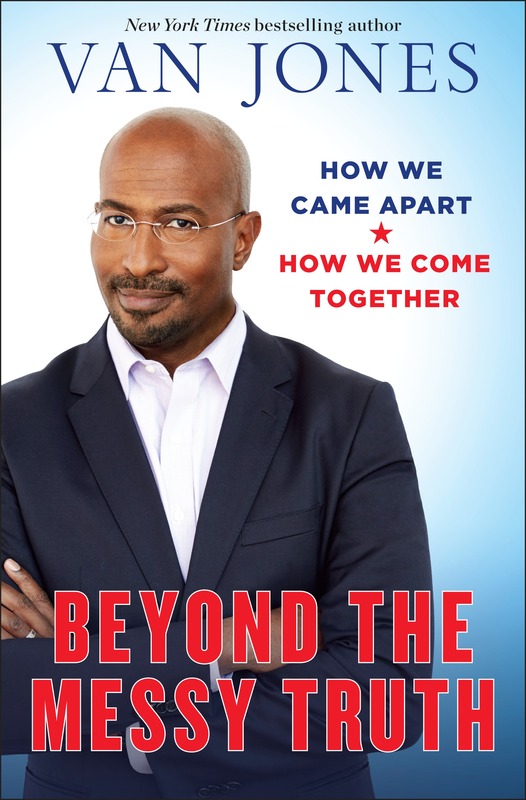 Van Jones’ beautiful new book, Beyond the Messy Truth: How We Came Apart, How We Come Together, is an important masterpiece. Interspersing compelling narratives about his personal life, it calls on liberals and conservatives to more fully respect and understand one another. If they do, he convincingly argues, they can find common ground and make positive improvements on numerous issues, including criminal justice reform, the addiction crisis, training disadvantaged youth for tech jobs, and promoting green jobs in poor rural and urban communities. He makes a persuasive case that traditional conservative values hold merit, as do liberal values. But elite partisans on both sides have distorted those values with narrow dogmatism. By setting those dogmas aside, a “bottom-up bipartisanship” can counter that neoliberal “top-down bipartisanship” that has caused so much damage in recent decades. The result has been great frustration and resentment among the white working class, which the Democratic Party has largely ignored and often disrespected. That neglect led to the successful left-populism of Bernie Sanders and the right-populist rhetoric of Donald Trump, which helped him win the White House — aided by what Van calls the “dirty right,” which includes white supremacists and neo-Nazis who, along with Trump, fanned the flames of racism. Van’s “greatest fear” is the growing strength of that dirty right. He calls on true conservatives to denounce those groups forcefully. According to Van, the way forward to a positive, proactive grassroots movement that unites Americans “across the board” is a patriotic affirmation of core American values: all are created equal, and liberty and justice for all. Conservatives have emphasized liberty. Liberals have focused on justice. Van says we need both. I agree with what Van has to say in this book, with two exceptions. One problem I have is with his total embrace of “American exceptionalism.” America is no more unique than other nations and it is not unequaled in terms of its positive qualities. The World Happiness Report, published by the United Nations, ranks nations. In 2017 the United States ranked 14th overall — only because it was 9th in GDP per person. On every other measure, the U.S. ranked much lower. And its overall score had declined since the previous report. Humility on the world stage is in order. The book’s most serious flaw, as I see it, is its unequivocal affirmation of the upward-mobility template that is reproduced through our society (and contributes to the mythology of American exceptionalism). That template nurtures hyper-individualism, extreme competition, the desire to dominate “inferiors,” and the willingness to submit to “superiors.” Requiring the poor to climb out of poverty is no way to eliminate the human and social costs that are inflicted by poverty. That upward-mobility requirement fails to honor the principle of equality that Van highlights. We will not have equal opportunity so long as some people must climb a ladder to make ends meet and others do not. If privileged youth have guaranteed economic security, so should everyone. Even if we eliminate unfair discrimination, offer compensatory education and training to poor children, and provide community support, as Van recommends, we still will not have equality before the law. Worse yet, equalizing the opportunity to climb out of poverty will not end poverty so long as the federal government creates unemployment and poverty by limiting the number of living-wage jobs — in order to protect the creditor class from unexpected inflation, which eats away at their assets. The result of that policy is an inadequate number of jobs at the top of those ladders. Moreover, so long as the goal of upward mobility is to climb higher so you can look down on and dominate those below, we will not have an egalitarian society. Rather we’ll have one based on achieving “superiority.” Van does not address that dominate-or-submit dynamic. Meritocracy — a system in which individuals are rewarded based on ability rather than class privilege — is not democracy. The notion of having to climb ladders is a zero-sum concept. The assumption is that if you get ahead, I fall behind. A better solution is to affirm another founding American principle: promote the general welfare, which is included in the Preamble to the Constitution. If you thrive, I thrive. Distributing federal revenue sharing funds to local governments, a conservative principle, to assure everyone a guaranteed living-wage job opportunity would help close the inequality gap. Then those who want to climb a social ladder could do so, but they would not be compelled to do so in order to live decently. A deep commitment to equality and love requires that we do no less. But Beyond the Messy Truth barely talks about love. It affirms “love of nation,” briefly refers to Christians who embrace love, and asks those who are secular to respect Christians and other spiritual people. But it does not explicitly urge secular people to make a deep commitment to compassion in their daily life. The book does say, “You can’t lead people you don’t love,” but the next sentence basically reduces love to “respect,” which is the primary theme of the book. It focuses on how political activists need to respect one another, but it does not deal with how all Americans need to respect one another throughout society and nurture collaborative teams whose members treat one another as equals. We recognize that our challenges are intertwined and that being united is our biggest strength…. Learn from mistakes, get better every time…. Relationship and community are the foundation of change. Call each other up – not out. Healthy competition has its place but cooperation is more often what we need…. Strive to be better. Trust yourself. That affirmation of love, cooperation, mutual support, and ongoing self-development is powerful and critical. Beyond the Messy Truth is an extremely valuable contribution that aims to help us “begin to come together, in a new way,” as Van envisions. The book points us in the right direction. Hopefully, the #LoveArmy will help us take more steps down that path toward fundamental social transformation. For the first time in my life, I found myself with a sizeable group of political activists willing to be open and honest about personal failings and mistakes and committed to ongoing self-development as well as pragmatic and visionary political action. I felt like I had found a home. It was last night at a #LoveArmy forum convened by Anjali Sawhney in San Francisco. Some Thrive East Bay events I’ve been to recently have also been rewarding. But this one seemed to hit even closer to the center of my heart. An African-American man who said he can have civil conversations with racists. A white mediator who convened a number of virtual dialogues between liberals and conservatives prior to the last Presidential election. A white social-service worker who decided after struggling with it not to label Trump supporters “irredeemable” and “deplorable” but still believes it’s important to “call them out” for noxious behavior. A white man from Iowa struggling with trying to understand his friends and relatives back home who have troubling opinions. An African-American man who’s helping to organize a “million-man” march on Washington of formerly incarcerated individuals in three years. During introductions, when I expressed my passion, Anjali responded, “Wow. That’s really in line with our mission.” That felt good. As I left, she said she hopes to participate in my November 9 book club discussion of the new book by the #LoveArmy founder, Van Jones. I left with a warm glow and a free copy of his book, Beyond the Messy Truth: How We Came Apart, How We Come Together. My main reservation about the forum was a feeling that some of the participants may worship Van too much. He’s very compassionate, charismatic, wise, sharp, articulate, and quick. Partly because I’ve had some good connections with him in the past, I trust him and hold him in very high regard, though I haven’t agreed with everything’s he’s said. But our experience with Barack should remind us: no one will be our Savior. No one is perfect. Submission is always problematic. We, the people, must be leader-full. The experience with Jesse Jackson and the Rainbow Coalition illustrates another point: structure matters. How to organize a democratic grassroots movement is not easy. A balance between centralization and decentralization is essential. Representatives from the grassroots need to have a real voice with the national office, without paralyzing it. I look forward to hearing what Van and his team think about this issue. In the meantime, I’ll read Van’s book quickly and take note of points with which I disagree. It’ll be interesting to see how many there are. Reading it may prompt me to modify extensively the booklet I’m writing, Transform the World with Holistic Politics: Grow Supportive Communities . But I suspect his book will only help me improve my work.